With summer almost on us in the northern hemisphere, how would you like to go on a vacation – have fun and get rich? Today’s WayBack Wednesday takes you to a treasure that has still not been found. So, get your suitcase packed, grab a map, a thermos, and let’s go look for Nothing Says Elegance Like Fabergé (Lost Treasures Part 2). Lake Toplitz is an alpine lake in Western Austria. The lake is a mile long and three hundred feet deep. Sunken logs in the lake make diving very dangerous and many divers have died in the lake’s depths. Visibility is good only to about thirty feet and below sixty feet there is no oxygen in the waters. During 1943-44 the German navy used the lake for testing. Early in 1945, as the Third Reich crumbled Nazi trucks stopped at the Weisenbecker home waking up the occupants. They ordered the people to harness their horses to wagons in order to take a cargo to Lake Toplitz. The horses were harnessed and wooden crates were transferred from trucks to the wagons. Ida Weisenbecker is still alive and has been interviewed many times about what she saw. On the third and final wagon trip to the lake she saw Nazi officers dumping the creates into the lake. Since that day treasure hunters have scoured the lake in search of lost Nazi gold. Hundreds of millions of dollars, possibly billions, were missing after the fall of Nazi Germany. Many believe the Nazis hid gold, silver, and jewels throughout Europe and some of that is hidden in Lake Toplitz. To date only counterfeit banknotes and papers have been taken out of the lake. But the treasure hunters continue their search. Even the news program 60 Minutes gotten into the act. So what is really on the bottom of Lake Toplitz? Most likely more creates of counterfeit banknotes and documents the Nazis wished to keep out of the hands of the allies. Some of those documents may contain the bank account information to Nazi bank accounts in various countries. What of the Nazi gold? While it is true that the Nazis stole tons of gold and took the gold teeth from concentration camp victims (melted down into bars) that gold was most likely deposited in Swiss bank accounts and transferred into financial vehicles much easier to transport than gold bars. Some of that gold may still be in Swiss banks. For decades the Swiss have sought to hide their role as bankers for the Third Reich. But, documents continue to surface indicating more and more Swiss involvement in the affairs of Nazi Germany. 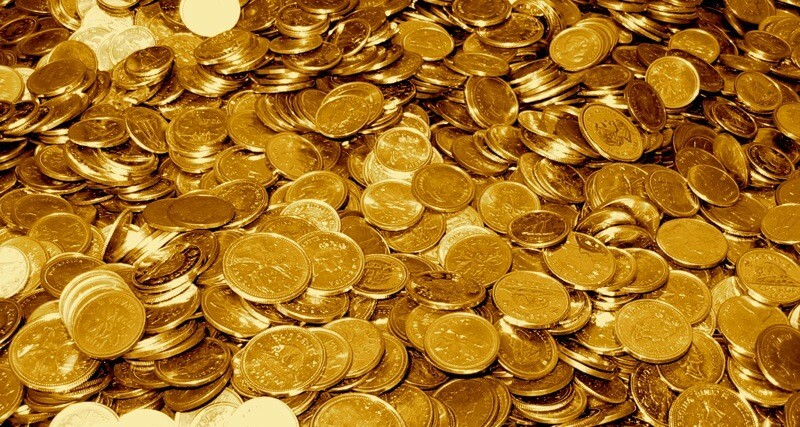 Swiss gold coins minted in the mid 1940s have mercury levels ten times the level expected in gold coins. Mercury was used in the gold used to create, fillings, crowns, and teeth. It is suspected those Swiss gold coins may have been made from gold fillings, crowns, and teeth of people killed in the Nazi concentration camps. But we will never have solid evidence to tell us what happened to all the Nazi gold and silver. So, is there Nazi gold at the bottom of Lake Toplitz? Probably not, but maybe …. Today’s WayBack Wednesday takes you to a treasure that has still not been found. So, get your suitcase packed, grab a thermos, pick, and a shovel and let’s go look for Yamashita’s Gold (Lost Treasures Part 1). It is 2:30AM and I cannot sleep ~ again. Sitting in my window looking south. An occasional car passes, but mainly I see the lights of the city. Centered in the window of my “Eagle’s Nest” (so dubbed by my neighbors) are the green lights of one building in particular. It sits on the corner of Main and 2nd streets a few blocks from the post office. The green lights frame the pyramidal roof, crowned by two red lights at the peak. This is my home, it speaks to me and calls my name. The first time I stood here with the realtor waiting on a friend of mine (I always want a second opinion) it spoke to me then. I have never felt so “at home” before. I will not spend the rest of my life here, I cannot, I am a wanderer and a seeker. Even as I live here now I continue to go forth. Sometimes I travel a few blocks, sometimes a few states, or even to another country. No matter where I wander I am always seeking. Sometimes I am seeking even before I know the question. I have the curiosity of a child (and the impudence of one too). I like language, I like words. In ancient times people believed if you knew the one true name of a god you could control that god. Words have power and each word is unique. Adventurers and pilgrims are both travelers, and yet they convey a different meaning, they produce a different mental image for us. I know some Spanish and a few words in several other languages. Though my native tongue is English. English isn’t just English words, no we borrow words from many languages. I like English I find it so expressive. Why just for the word traveler there are dozens of synonyms, adventurer and pilgrim being just two. Yet with all the variety of English we have only one word for the most powerful word of all – love. Love is an intangible like liberty. You cannot detect love with your five senses, only the evidence of love. Love is one of only two intangibles for which people will sacrifice their life and all they hold dear (liberty being the other). One word – that’s it – just one word. We love our pets, our children, our parents, our relatives, our friends. All of those are different kinds of love, but still just one word. Our children we are willing to protect at all costs. We nurture them, teach them, we revel in their very essence. When they come home from school and explain to us the sun is a star, we listen as if they are teaching us something we never knew. Then there is the love we have for a lover. This is the love where we are at our most vulnerable. Then, if we are truly lucky, we experience a love that marks our very soul. It changes you – from the inside, and you are never the same again. That is a love that never dies. If that person dies or you get a divorce or breakup, they are still a part of you. The love you shared marked your soul, it changed you. And though separated by time and space they will always be a part of you. People talk about the power and the strength of steel and granite. But it pales in comparison with the strength and power of love. Look into the eyes of your own child. 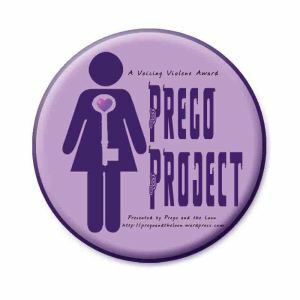 Do you feel that within your breast? See how your child looks at you? There is nothing as powerful as love. Yet, just one word. From pizza to life altering and soul touching we have just one word. Yet if a god, as powerful as a god is, has only one true name shouldn’t the most powerful force of all have just one word? This is a look back at one of your favorite articles ~ The Art Lesson. 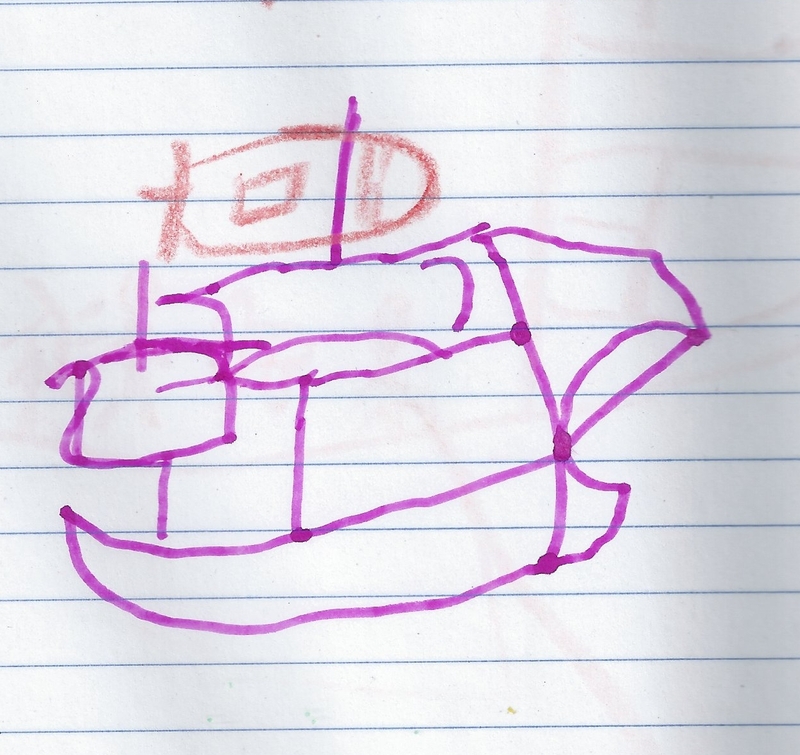 Elizabeth’s first sailing ship, drawn just like John Alexander taught me when I was not too much older than her. (Elizabeth added the flag on her own).